After covering Punjab, Maharashtra and Andhra, today we move on to Karnataka. Today's curry is specifically from the Udipi cuisine. 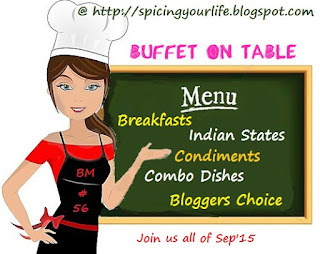 The simple menu here is Masale Chitranna, Moong Dal-Udipi style, Rice and Beetroot Gravy Curry along with yogurt. The moong dal and masale chitranna recipes will follow soon. The spices in this curry takes the humble beetroot to an altogether new plane. So if you do not relish the bland taste of beetroot, this curry will probably appeal to you. In a pan add a cup of water and beetroot cubes. Add jaggery/sugar to it and let it cook. In a pressure cooker, boil the toor dal with 1/2 a cup of water. Meanwhile, prepare the masala for the curry. In a different pan, add oil and roast all the ingredients listed under Roast and Grind separately . Grind them all together adding a little water into a smooth paste. Set aside. After the beetroot is cooked through, add the cooked toor dal, the masala paste and salt. Add more water to adjust the consistency. Prepare the seasoning by heating oil and adding the seasoning ingredients. Pour the seasoning into the curry and mix well. Beetroot cooked with dal , wow never heard of it.The thali looks delicious. Thats a very interesting curry , like Sapna says never cooked this way , though i add beetroot to tuar dasl while boiling but this is totally new. And that thali looks fantastic . Looking forward to the rest of the recipes. Quite an irresistible Thali, that masala chitranna makes me hungry.. Very catchy and beautiful gravy there. The gravy looks so delicious and colourful. Entire spread looks so inviting Harini..very nicely presented! Never made curry with beetroot.. Sounds interesting..I looks so colorful & yummy. Very interesting and delicious curry with beets. Looks amazing. This is a new one to me. We love beets and am thinking we are going to love it. to use beets in a gravy dish is quite unique to me - I usually think of beets in salads or just roasted on its own - wonder how the sweet beets are in this?